The older I get, the more I enjoy foraged foods. They bring back powerful memories of foods my ancestors loved. Last September my husband and I were thrilled to find a hickory nut tree in a fence row. We gathered and hulled the fallen nuts, then brought them home and spread them out on newspapers to dry. Last week-end we cracked the hickory nuts and then used nut picks to remove the tiny nut meats. The process was incredibly tedious—and the pile of shelled hickory nuts grew with agonizing slowness. I knew that I had to find the perfect recipe to use the precious nuts. When I saw a recipe for Hickory Nut Macaroons in the Lycoming Valley Cook Book, I just had to try it. The cookbook is a 1907 church cookbook compiled by the Ladies of the Trout Run M.E. Church, Trout Run, Pa.
Here’s my updated version of the recipe. Preheat oven to 350° F. Put the egg whites into a mixing bowl and beat with an electric beater until stiff peaks form. Slowly add sugar, one tablespoon at a time, while continuing to beat. Add flour, and beat just enough to blend it into the mixture. Then gently fold the hickory nuts into the egg white mixture. Drop by rounded teaspoons two inches apart on greased baking sheets. Bake for 12-14 minutes or until the macaroons are just starting to turn light brown. The verdict—The macaroons were incredible. They were light and airy with a chewy texture on the inside and crispy on the outside, and the complex buttery taste of the hickory nuts took me back to long-forgotten flavor sensations from my childhood. Here’s the original recipe. Would you interpret it the same way that I did? 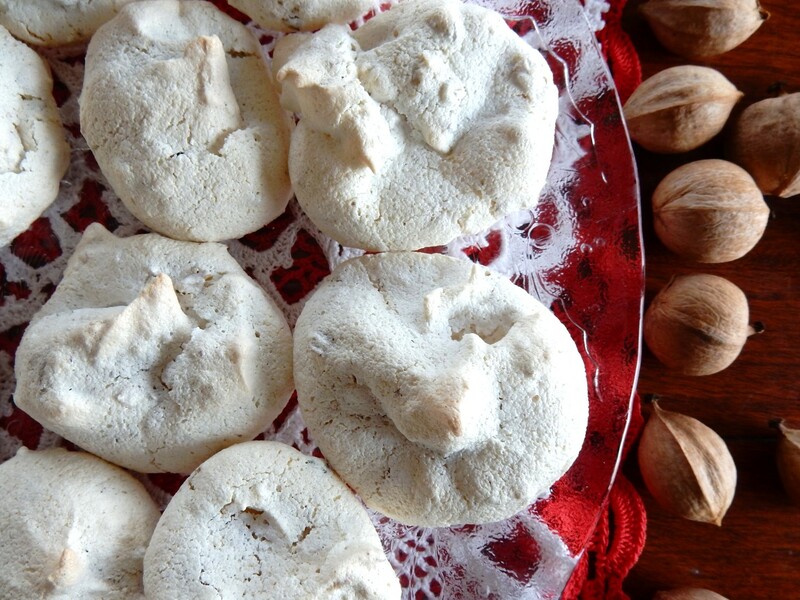 Posted on November 29, 2015 December 18, 2015 by SherylPosted in FoodTagged hickory nuts, macaroons, recipe. What a wonderful find—both the hickory nuts and the recipe. A quick oven must have been tricky to interpret! I looked at several modern macaroon recipes, and most called for temperatures somewhere between 325° and 375° F. I went with 350° because that’s in the middle of the range–though the phrase “quick oven” makes me think that the author of the original recipe may have used a higher temperature (and a shorter cooking time). Did you also learn, as I did, that a “moderate” oven meant you could stick your hand inside and count to –what was the number? It has been too long!–before it got too hot for your hand? This one’s new to me–but it sounds like the kind of practical tip that my mother might have taught me. I love those old recipes–and the idea that they made sense to our grandmothers when written that way! I had a couple of pounds of pecans in the shell and it took me FOREVER to crack and shell them all. I got a new appreciation for grocery store nuts! Old recipes generally seem to assume that most cooks understand all the basic cooking techniques–and that not much explanation is necessary. Cooks a hundred years ago must have been very skilled. And there was also that “cooking in a wood-burning stove” too! It had to have been difficult to bake with a wood-burning stove. I can’t even imagine how they could get (and maintain) the desired level of heat by somehow adjusting how hot the fire was. And – WE think we eat good… 100 year old recipes can’t be beat!!! You’re absolutely right. There are some awesome old recipes. I am thinking about Trout Run. A great name for a beautiful place. The village’s name wonderfully conveys how picturesque the area is. I always really enjoyed driving north from Trout Run on Route 14. I think that it’s one of the most scenic roads in PA. I remember my mother gathering Black Walnuts one year. They were spread out on a table in the basement to dry. I remember they had a distinct smell but I don’t remember cracking enough to make anything or even to eat. Yay for you, collecting, shelling and using them in a recipe! Lovely post, and those church lady cook books are the best! It’s nice to hear that you liked it. I agree about the church (and other community) cookbooks. People really tried to put their best recipes in them, because they knew that their friends and neighbors would make them. It’s so interesting how they wrote recipes in those days. I have one or two like that from my mom that I’ve had to “interpret”. I never cease to be amazed that cooks apparently were able to successfully use these “minimalist” recipes back then. I never had hickory nuts. Are they similar in taste to hazelnuts? I’m not a nut expert, but I think that hickory nuts are more closely related to pecans than to hazelnuts–though hickory nut trees definitely grow further north than pecan trees. I have a pound and a half of SHELLED black walnuts. I think they might do just fine for these cookies. I think this must be very similar to the meringue kisses my mother always made. We liked meringue shells, too, filled with homemade curd, or ice cream. Christmas often was a time for meringue shells with peppermint ice cream and chocolate sauce. I rarely make them here because of the humidity, but if we happen to get a good cold front that clears things out, I may try both these cookies and the shells. I also think that black walnuts would work well in this recipe. I’m getting hungry just reading your comment. The meringue shells with peppermint ice cream and chocolate sauce sounds awesome. It’s wonderful to hear that you use the same recipe. In the opinion, nuts adds a wonderful dimension to this classic. It also sounds really good to dip them in chocolate. If you do some experimenting with it this holiday season, be sure to let us know how it turns out. In all my cooking years I never heard of a quick oven! So I did a Google search here what I found.. A “Quick” oven is a hot oven, about 400degrees Farenheit. Cookies look wonderful!! Thanks for researching this. If the higher temperature was used, the number of minutes would need to be reduced a little. Wow, those cookies look incredible, I can imagine they are so very delicious! Yum! What a great way to make memories. I have so many wonderful memories of holiday baking over the years. There are a number of foods that were popular years ago that are seldom eaten today because they don’t transport very well or are difficult to process. (I’d put hickory nuts in the later category since they are hard to shell.) Somehow this brings to mind the pawpaw fruit. It’s an old-time fruit that’s popular in Ohio, but never really entered the commercial market because of its short shelf life. .
Hi Sheryl, so nice to be here visiting. It’s been months and months since I’ve been able to do much visiting, or even posting on my own blog (I ran for state delegate), and in that time, you’ve changed things up a bit. It’s wonderful hear from you. After I posted the last entry from my grandmother’s diary in December, 2014, I did another blog for a couple months–and then took a hiatus from blogging. During that time I realized how much I enjoyed researching and writing about the early 1900s, so I restarted A Hundred Years Ago in early September. At that time I shifted the focus to recipes and foods from a hundred years ago. You made me think of my father and my aunt who always remembered fondly collecting nuts when they were children. The macaroons sound absolutely delicious! I also have memories of relatives collecting nuts when I was a child. In my case, I particularly remember my grandfather (not the husband of the grandmother whose diary I posted, but rather the one on the other side of the family) collecting nuts in the fall–and then shelling them during the winter. I made these tasty beauties but I don’t know these type of nuts & could not find a decent translation. I used hazelnuts in them! Divine! It’s wonderful to hear that they turned out well with hazelnuts. Hickory nuts are seldom found in stores, but in parts of the U.S. hickory nut trees grow wild in the forests and fence rows. Hickory nuts are a fun food to forage. It’s easy to gather lots of them–though it’s difficult to crack them and get the nuts out because they actual nuts are quite small.